KIEV, Ukraine -- Toward the end of his time in office, former president Viktor Yushchenko was catching a lot of flak for the reforms he had promised but failed to deliver. Still, one of his major achievements was the establishment of true freedom of speech: over the last five years, Ukraine's media have been free to publish what they liked for the first time ever. Many believed that this freedom of speech had taken deep root in Ukraine for good, but those hopes have faded fast following the election of President Viktor Yanukovych in late February. Amongst the first things the new administration did was to resort to old habits of trying to restrict what the media can report on. Some media tycoons had already seen the writing on the wall - Yushchenko ally Alexander Tretiakov sold his Glavred Media company to billionaire Ihor Kolomoysky, who backed Viktor Yanukovych in the presidential election. Earlier, Kolomoysky had successfully become a shareholder of the popular 1+1 TV channel. The Democratic Initiatives Foundation, a reputable Ukrainian pollster, this summer asked 28 top journalists and media experts if censorship is back. It is, found the survey. The respondents were asked to grade media freedoms on a scale of 1 to 10. 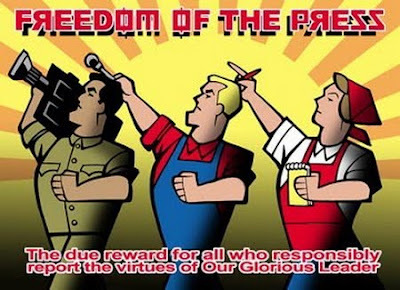 The press freedom score fell from 7 in 2005 to 4.3 in 2010, and is now headed towards its all-time low of 2.4 in 2004, the last year of former president Leonid Kuchma's hopelessly corrupt and authoritarian reign. The respondents said media management is the first to blame for increasing censorship, followed by journalistic self-censorship. But the president and his administration, state authorities, police and the intelligence agencies are now all actively pressuring the press. "There is a weird mix of censorship coming from the media owners and journalists' self-censorship, plus soft censorship coming from the state agencies," says Vakhtang Kipiani, reporter and media expert who took part in the survey. "Media owners are scared to death of [tax] inspections and other kinds of pressure that state authorities can apply, so they 'tailor' their materials in the right way without being asked from the top." Another survey – content analysis of broadcasters conducted by Internews Network U-Media - also showed a significant shift to censorship: a bunch of the biggest national TV channels were showing similarly biased news packages. No surprise that the First National Channel, which is funded from the state budget, is sycophantic to the new administration. After all, Walid Harfouche, vice president of the channel, once stated that the mission of the company is to glorify Yanukovych. "There should be at least one channel who says good things about the president and his team," he told the UNIAN news agency. "There are other media ready to criticize him [Yanukovych] any time." The nation's top broadcaster Inter Channel (owned by one of Ukraine's richest men and Yanukovych ally Valeriy Khoroshkovsky) has also persistently indulged the president and his administration with eulogies on their achievements. Its reporters don't bother to cite alternative points of view and often leave out the opposition's opinions altogether from their coverage. Criticism from both domestic and international watchdogs regarding frequent human rights violations, multiple police abuse cases and other issues also go unreported. Khoroshkovsky is not just a part of Yanukovych's team as chair of the powerful Security Service of Ukraine (SBU), but he is also one of the key people responsible for shaping the Yanukovych-friendly media environment. So far he's been performing perfectly: two feisty channels – Channel 5, which was a mouthpiece of the Orange Revolution in 2004, and a relatively new but sharp-tongued channel TVi – were deprived of frequencies by the courts on the basis of a lawsuit filed by Khoroshkovsky's UA Inter Media Group, which convinced the court the licenses were assigned illegally. As a result, TVi lost its terrestrial broadcasting and remains on cable; Channel 5 could lose its status as a national news channel. The problems the channels face are complex – they lost the frequencies partly due to murky schemes over the distribution of the frequencies as well as some unwise managerial decisions - but Mykola Kniazhytsky, TVi executive director, says the court made its decision under heavy pressure from Khoroshkovsky. "The SBU goes beyond its powers and gets involved in a dispute between TV channels - the president's administration ignores this case as well as cases of physical assaults against journalists," Kniazhytsky says. "No wonder media are being shut down and journalists go missing in a country like this." The print press is not as influential as the broadcasters, yet newspapers have also found themselves under pressure from their owners or managers. Regional and municipal newspapers can hardly make ends meet, so are totally dependent on the good will of local bureaucrats and officials. Viktoria Siumar, director of the Mass Information Institute (a reputable Ukrainian media think-tank), says he knows of cases where regional "barons" (ie. governors) have demanded papers photoshop out their double chins. Most print journalists won't talk about censorship issues openly, fearing their complaints will cost them their job. Most worrying, the spectre of assassination has resurfaced, something that has haunted Ukraine's media since Georgiy Gongadze, editor of the outspoken liberal online news service Ukrainska Pravda, was kidnapped and murdered in 2000. Three former officials of the Interior Ministry's foreign surveillance department and criminal intelligence unit were convicted of the murder, though no-one has yet been charged with giving the order for Gongadze's murder, even though audiotapes surfaced on which former president Kuchma and other top-level administration officials could be heard discussing the need to silence Gongadze for his reports about high-level corruption. Now another journalist has gone missing, feared dead. Vasyl Klymentiev, publisher of small newspaper New Style that mainly deals with uncovering corruption and crimes carried out by police and tax authorities in the city of Kharkiv, went missing on August 11. Klymentiev's colleague Petro Matvienko believes he is the victim of one of the corrupt officials he used to write about. A lot of journalists suffer physical assaults from police and officials' bodyguards, but despite evidence the wrongdoers are seldom punished. "I think that Ukrainian media will follow the way of the Russian media," media expert Siumar says. "We'll have a couple of 'alternative' print media, so every time the state officials receive criticism for cracking down on media they will say, 'We do have independent media, what else do you want?" International organisations and media watchdogs have become sufficiently concerned that they are already voicing concerns. France-based Reporters Without Borders issued in September a 14-page report criticising the increase in physical attacks on journalists, growing censorship and the passive position of law enforcement agencies when it comes to investigating the violations of journalists' rights. "Broadcast media pluralism has been seriously eroded," reads the statement. "If the trend continues, the freedoms acquired in recent years could be swept away and the advances needed to improve civil liberties, including freedom of expression and the right to information, will not take place." President Yanukovych for his part doesn't deny censorship and other issues exist, just he says they are being highly exaggerated by the opposition - a view that's, needless to say, well documented.